Maruti has been eyeing the launch of the Honda Amaze with keen interest, given that the Amaze is actually a car that could potentially chomp a bit of its market share. And just so that buyers don’t get too tempted with the Honda Amaze, Maruti has brought out a limited-edition Maruti Dzire Regal. Maruti says it is to celebrate five years of the Maruti Dzire in India. This limited edition Maruti Dzire is based on the VXI petrol variant of the car and is aimed at boosting sales of the petrol Dzire, which doesn’t see much demand. It is priced at Rs. 5.60 lakh ex-showroom Delhi, and comes with some added features compared to the regular Maruti Dzire VXI, which is priced at Rs. 5.53 lakh ex-showroom. Also read: Facelifted Maruti Dzire coming to counter Honda Amaze. 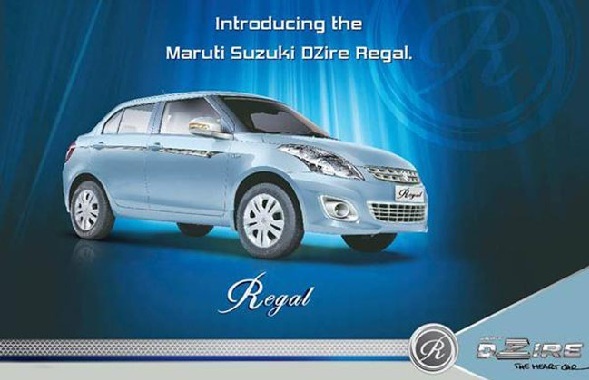 What’s new with the Maruti Dzire Regal? In terms of exterior enhancements, the Maruti Dzire Regal first comes with a new colour – a serene blue shade. Besides that it gets a Regal badge, chrome grille and fog lamps, chrome strips on the side of the body, silver painted exterior mirror covers, reverse parking sensors and body coloured mud flaps. On the interiors, the Maruti Dzire Regal gets an integrated audio system with six speakers (from the ZXI variant), but no steering controls. It gets faux wood panels in the door pads, a full leather covered steering wheel, stainless steel sill guards, art leather seat covers with a couple of free throw cushions, beige floor mats and a car perfume. These additions in themselves make this car very good value for money as it offers all the goodies one would normally pay at least Rs. 15,000 more for, but at a nominal increase of only Rs. 7000 over the regular VXI variant. At Rs. 5.60 lakh ex-showroom for the Maruti Dzire Regal, it goes directly against the Honda Amaze 1.2 S manual transmission variant that is priced at Rs. 5.62 lakh. At that price, the Maruti Dzire VXI Regal now has more features to offer than the Honda Amaze. Read: Honda Amaze VX Diesel vs Maruti Suzuki Dzire ZDI: Features and specs compared! The Honda Amaze S variant offers a music system with only USB and Aux and no CD, and four speakers. It also gets electric mirrors and height adjustable seat, but no fog lamps. So in that sense, if you are looking for extra features the Maruti Dzire Regal offers a bit more. But the Amaze still is good value when it comes to interior space and boot space – offering more than the Dzire. « Does Nissan’s lower-than-lowest EMI scheme really save you cash on Sunny and Micra?